You Got This, Brutadon! is a game for Amazon's Alexa. You can play it on an Amazon Echo or an Echo Dot. Here is its store page. Like all Alexa skills, it is 100% free. In You Got This, Brutadon!, you are the hype man for a fifty-story-tall monster in a kaiju battle. Brutadon is a tough fighter, but he's not confident. He needs strategy help and emotional support from you! You'll need to play this game in a place where you can shout loudly and use your voice in the name of true human/monster friendship. 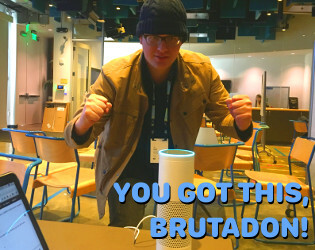 You Got This, Brutadon! was made for the 2017 Global Game Jam. You can find the GGJ submission page here. You Got This, Brutadon! is a Plus Ultra creation.